It will be a battle fit for the record books, one that will go down in history alongside Gettysburg and World War II. Only this one will not be fought with swords, guns or armies, but with little clickers and incredible knowledge. That's right, I am talking about the epic showdown set to take place on Jeopardy! 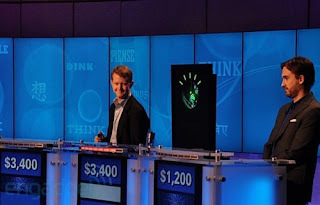 this coming Monday which pits two of the show's biggest all-time winners, Ken Jennings and Brad Rutter, against Watson, a computer designed by IBM. If you are not familiar with the popular game show that tests contestants' knowledge in a wide range of categories, then you will not know who Ken Jennings or Brad Rutter are. To put it simply, Jennings won a grand total of $3,022,700 on the show coming in second only to Brad Rutter who took home a total of $3,255,102. Needless to say, these gentlemen are extremely smart and ready to test their wits against the ultimate competitor, technology. According to Stephen Baker, author of Final Jeopardy: Man vs. Machine and the Quest to Know Everything, "The computer is fast on the buzzer, and if it's given certain specialties - it's good on facts about facts it can find and nail down - it could win. But humans are better with complex English, puns, nuances, so..."
This challenge was initiated by IBM after its scientists worked on Watson for four years. The outcome has already been determined as the show does not air live, but it is a secret. The episodes were taped on January 14th, 2011 and are set to air on Monday, February 14th, 2011 and conclude on Wednesday, February 16th, 2011. Alex Trebek, the host of Jeopardy! since 1984, isn't budging on giving away the result either. "I think the guys have a slight edge on knowledge because their memories are good," says Trebek. "In terms of speed, it's no contest. Watson has the edge there. But it'll all come down to luck." Trebek also added that Watson could not see or hear him "so it was pointless to comment in his direction!" Executive Producer of Jeopardy! Harry Friedman noted that putting the show together was definitely a challenge. Nobody has every done this before and the closest thing to be done like this was when chess grandmaster Garry Kasparov took on an IBM computer known as Deep Blue. He lost. According to Friedman, "Producing for people and with people is one thing, but dealing with a computer was another." Friedman sees the competition as a "fascinating exhibition of technology" and not a tournament or a competition. "It is to be judged for what technology can do," he says. However, don't tell that to Jennings or Rutter. Jennings stated that he was spooked by the setting, which took place inside the labs of IBM. "No one was cheering for me. It was at their (IBM's) home arena. It was an away game for humanity." Rutter, who has won the highest accumulative amount on Jeopardy! ever, says that he does not think humans are becoming outdated and that he enjoyed being a "guinea pig" playing against a computer. According to Rutter, "People watch the show to see the contestants and how they react. Watson will never jump up and down when he gets it right." The contest is going to air this coming Monday, Feruary 14th, 2011. Check your local listings so you can tune in and see who is smarter, man or machine.